Die Seejungfrau is the world première recording of the new critical version by Antony Beaumont, featuring some five minutes of music excluded from latter versions. The Helsinki Philharmonic Orchestra under John Storgårds, captured in stunnings SACD sound, delivers a suave and subtly nuanced performance. Storgårds's measured approach bring the opulent textures of Die Seejungfrau closer to the Expressionist sound world (...) than previous recordings. The Helsinki Philharmonic Orchestra under John Storgårds offer a fascinating program of two major orchestral works by Alexander Zemlinsky (1871-1942) as world premiere recordings. 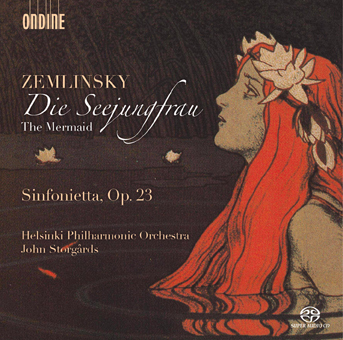 Die Seejungfrau (Mermaid) is a powerful 3-movement symphonic "fantasy" written by Zemlinsky in 1902. Before the work was premiered in 1905 Zemlinsky had already made radical cuts, which included removing 14 pages of the original score. For reasons still unknown today Zemlinsky withdrew the score and since 1910 never mentioned the work in his catalogue of works. The work was not heard again until 1984. The lush romantic score has appealed to its listeners ever since. This release is the first recording of a new critical version based on the original score. Zemlinsky escaped Germany in 1933. The Sinfonietta, Op. 34 was written soon afterwards and premiered in Prague in 1935. The work is a fascinating example of Zemlinsky's late orchestral writing and stylistic evolution. The work is heard in this recording as a new version for chamber orchestra by the Austrian composer Roland Freisitzer (b. 1973). John Storgårds, one of Finland's exceptional artists, has taken the classical music world by storm in recent decades. Since 2008, Storgårds has been Chief Conductor of the Helsinki Philharmonic Orchestra and Principal Guest Conductor of BBC Philharmonic Orchestra since 2012. The latest releases by Storgårds on Ondine include the complete symphonies of Leevi Madetoja (ODE 1211-2, ODE 1212-2) and the Shostakovich Violin Concertos together with Christian Tetzlaff (ODE 1239-2).